Plate blocks of the 15¢ 1902 are notoriously difficult to obtain from the top position, especially with such wide selvage. 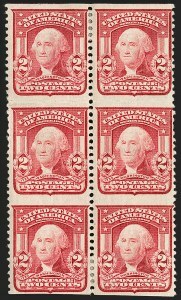 Power Search found only three from the top position--two have selvage significantly smaller than the block offered here, and the one with comparable selvage has thin spots in two stamps. 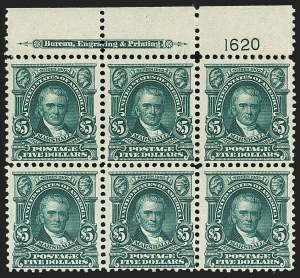 Todd had two, but one has a piece out of the top right corner stamp. This brings our total count to four wide tops. The Fogelson collection, which specialized in top positions, did not contain any. Those waiting for this plate block in Mint N.H. condition will have a long wait; we have offered only one, from the right position, in our 2003 "Silver Lake" sale. 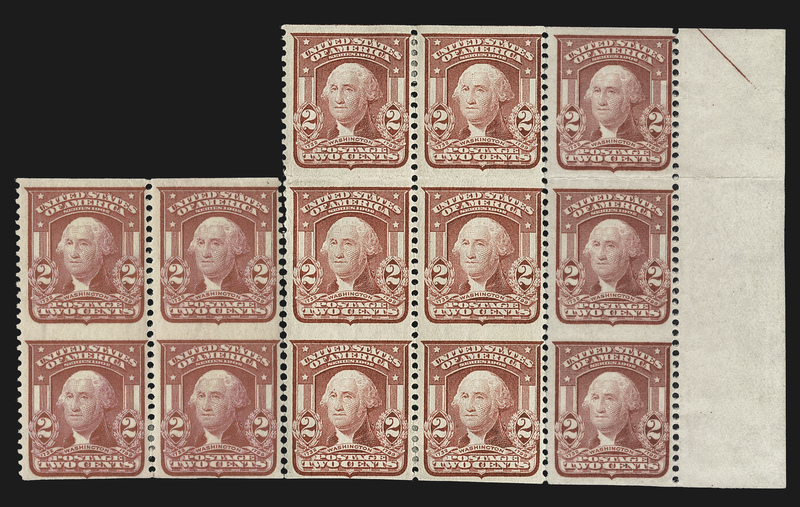 The Philatelic Foundation has certified one wide Mint N.H. top plate block of ten, but its whereabouts is unknown. 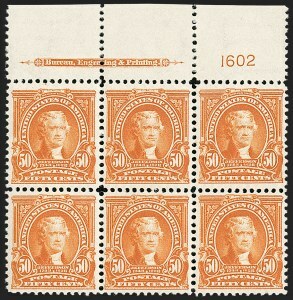 The 50¢ is the first denomination of the 1902 Issue printed from a single plate--number 1602. Top plate positions, which are the most desirable, tend to have narrow selvage. The example offered here is the exception. Power Search found only two from the top position, both with narrow selvage. Todd had two others with wide selvage, but one has disturbed gum and another has a piece out of the selvage. 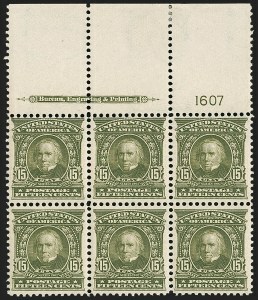 The example offered here may well be the finest full top plate block of this issue in existence. 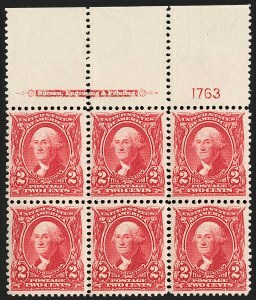 Lewis Kaufman records only seven available plate blocks of the $1.00 1902 Issue, including six from the top position and one from the bottom. In addition, there is a top plate block in the Miller collection owned by The New York Public Library. 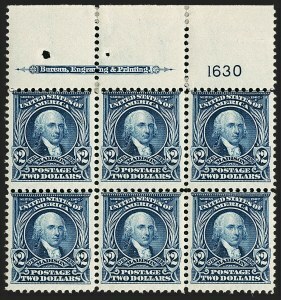 Lewis Kaufman records only four plate blocks of Scott 312 in private hands (each of six stamps). 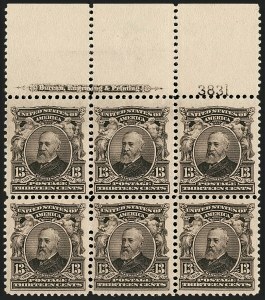 5) Top plate block, Miller collection, The New York Public Library, unavailable to collectors. 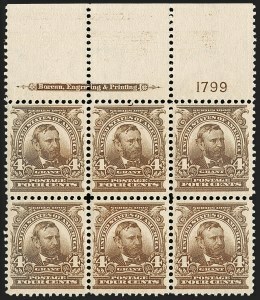 Only four plate blocks of the $5.00 1902 Issue are recorded, including one in the National Postal Museum (top position) and another in the Miller collection owned by The New York Public Library (extra wide bottom position). The only other plate block available to collectors, with similar size selvage and also from the top position, was offered in our sale of the W. Parsons Todd collection in 1977. 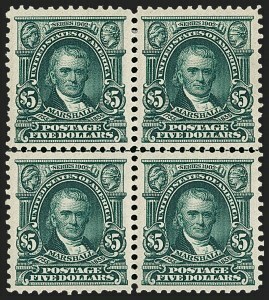 The 5¢ was issued as an imperforate stamp to be used by private vending machines. 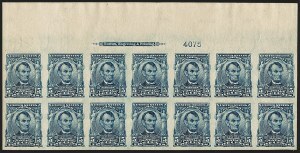 Only 34 sheets--13,500 stamps--were issued. 10,000 were sent to the Indianapolis post office and most were used in vending machines. 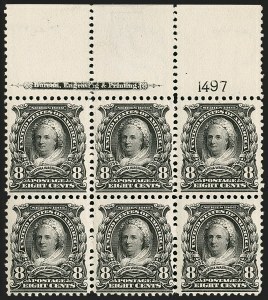 A small quantity was saved in imperforate form, primarily by collectors who heard about the issue and were able to obtain small quantities at post offices in Indianapolis, Washington D.C. and New York. 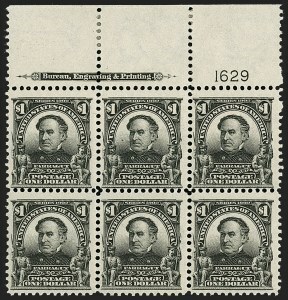 Very Fine; light horizontal crease between top stamps, bottom two stamps small thin spots from hinge removal, bottom right stamp with H. F. Colman backstamp, signed in pencil "E. Stern"
All examples of the 2¢ Shield Imperforate Horizontally error (Scott 319d) come from a block of 25 stamps bought at the Washington, D.C. post office. The block of six offered here and the strip of three with the selvage and guide arrow at right indicate that the discovery block came from the upper half of the lower right pane--a digital reconstruction with an additional block at left is shown below. 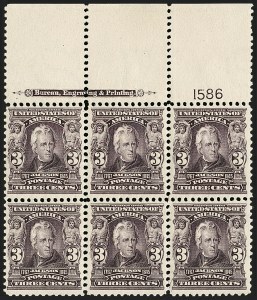 We have located three pairs, one strip of three, two blocks of four (one with two stamps removed from top, shown below) and this block of six, for a total of 25 stamps. Since this error must be collected in pairs (at a minimum), there can only be ten examples--the three recorded blocks reduce the number of available examples to seven. Digital reconstruction of Gross block of 6 with right margin strip and block of 4 at left in their original positions in discovery block of 25. There can be only 10 possible error pairs in total. Note: the different shades are the result of varying images and do not accurately reflect the items’ color.